Novelty bell is made of hand painted unglazed ceramic. Cute Christmas decor item. Made in Taiwan by Interpur. Measures 4" tall and has no chips or cracks. Porcelain clapper. Adorable little grey kitty sits a top this festive Christmas bell. She wears a red Santa suit and holds a doll. 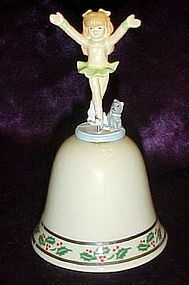 Bell is made of unfired porcelain and is decorated with gold stars, green garland and red ribbons. Measures 4 1/2" tall and is in great condition.There looks like a chip on one ear but it is the same color so may have been done before it was painted. Noticeable upon close inspection. Ring in Christmas with this cute kitty bell. I have matching puppy belll also. Little folk style angel made of unfired porcelain. She is hand painted and has a lace fabric trim. A small portion needs a dab of glue for the lace. Bell has no chips, cracks or damages and is painted nicely. 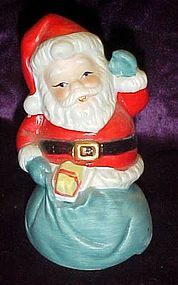 Measures 3" tall.Stamped & Dated 1986, BOA. Pretty little Christmas bell for your holiday table this Christmas. 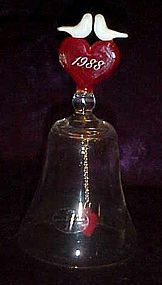 Elegant simple crystal bell measures 4 1/2" tall and is in excellent condition. The clapper is a tiny olde world Santa. Has a delicate pretty ring because of the crystal. 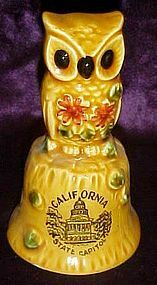 Older 1970's souvenir ceramic bell from Sacramento, the California State capitol. Made of hand painted glazed ceramic. Measures 4 1/4" tall and is in perfect condition. Old "Made in Japan" paper sticker. 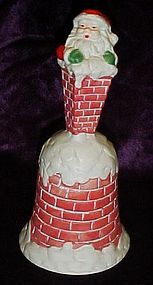 This sweet porcelain bell is hand painted and made of unfired porcelain(bisque). 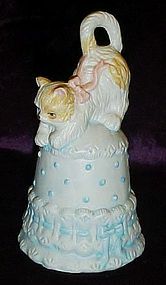 The bell area looks like th shape of a thimble and has ribbon and lace look trims, The pretty kitty cat is white with tan spots and a pink ribbon. Measures almost 5" tall, and is in PURRRRFECT condition. Made in China, but so sweet! 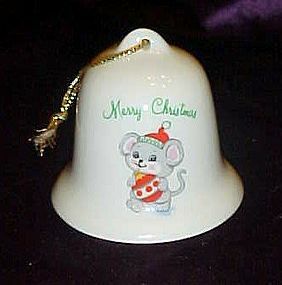 Adorable porcelain bell ornament with a little mouse holding a Christmas ornamentt and wearing a red stocking hat. Original Russ tag. No clapper Measures 2" tall. Adorable little flop eared puppy sits a top this festive Christmas bell. He wears a green Santa suit and holds a peppermint stick. 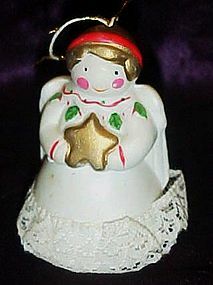 Bell is made of unfired porcelain and is decorated with gold stars, green garland and red ribbons. Measures 4 1/2" tall and is in perfect condition. Ring in Christmas with this cute puppy bell. Porcelain bell is a nice little touch for your holiday table. Made of glazed porcelain and hand painted accent. Top has a heart for the handle and is surrounded by two white doves of peace. a large applied sprig of holly decorates the front of the bell. Measures 4 1/8" tall. No damages. Santa bell ornament, Very cute!! A jolly festive little Santa bell to hang from your tree. Brightly hand painted and detailed. 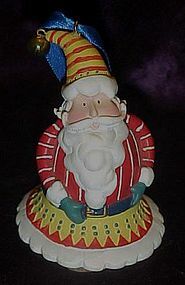 Measures 2 3/4" tall an has a polka dot wood clapper and a little brass bell on the tip of his hat. Made of a sort of clay or ceramic. Perfect condition. 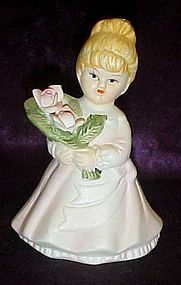 a sweet little girl bell is made of unfired porcelain and all hand painted. Measures 4 1/4" tall. No chips or cracks. Add her to your bell collection. 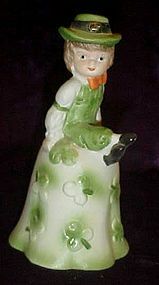 Adorable little Irish lad sits atop this porcelain bell covered in shamrocks. made of hand painted unfired porcelain. Measures almost 5" tall and is perfect condition. Ring in the luck of the Irish wth this adorable bell. 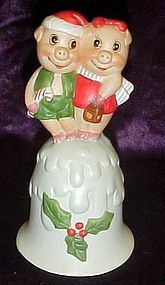 Unique and cute pig couple are dressed in their holiday attire and stand on top of this unfired porcelain bell. Hand painted with a large holly sprig on the front of the snow covered bell. Measures 5 1/4" tall and is in excellent condition. Ring in Christmas with these cute little porkers! 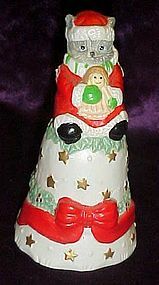 Whimsical hand painted Christmas bell is a delight for the holiday. Bell is unfired ceramic / porcelain and looks like all bricks with a snow covering. Santa Claus appears to be headed down the chimney. Measures 6" tall and is in perfect condition. adorable glass bell with a cute wedding couple at the top made of hand painted resin and a resin double heart clapper. Bell measures 5 1/2" talland would make a great topper for a wedding or anniversary cake. Has a gold string at the top and was probably intended to be used as an ornament. Perfect condition. 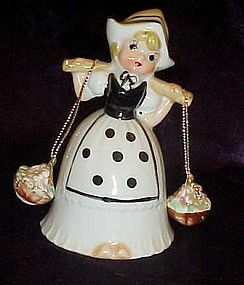 An adorable bell with hand painted details, made of bone china Taiwan. Over her shoulders she carries two baskets of flowers. These are the clappers. Measures 3 3/4" tall and is in excellent condition. A great addition to your bell collection. 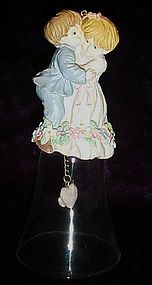 A 24% lead crystal bell with hand blown glass heart, white doves, and heart shape clapper. Bell measures 4 3/4" tall. Excellent condition with no damages. Dated 1988. Perfect for a special event that wasin 1988, or adding to a bell collection. 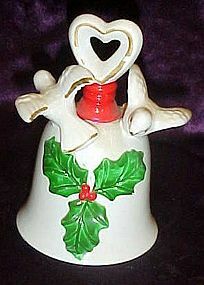 Adorable porcelain bell made by Enesco. This was probably a Christmas issue because of the Holly and berries trim. The top (handle) is a little ballerina girl and her kitty cat. 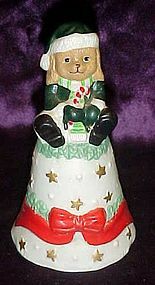 Measures 4" tall and is in excellent condition with no damages, and has original Enesco sticker. A nice gift. No box.